We have been having fun getting used to our new timetable and the response from the children has been great. We have been meeting up with nursery 2 to visit each others classes and garden. We have spent time in the gym hall, visited the wildlife garden, had fun in the woodies, wheeled toys and music and movement sessions. 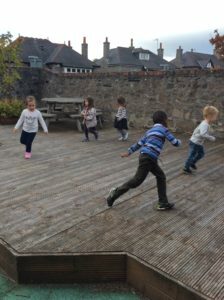 It is great to see the children making friends with each other and they have been so responsible making their way to each activity everyday. We will plan learning activities during these sessions each week. So far we have explored mark making in the garden which in involves using different tools and mediums to strengthen the muscles from shoulder to hands in preparation for writing. 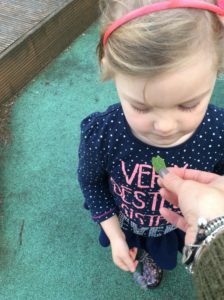 We also had a maths activity in the garden where the children looked for hidden shapes then tried to find these shapes in the world around them. 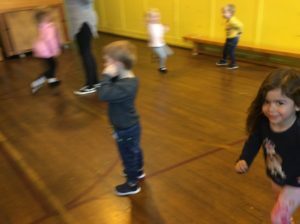 In the gym hall we have been practicing ball skills and listening to instructions through playing the game traffic lights. We talked about being safe on our first trip to the woodies and the importance of staying in the boundaries set by the teachers and had a nature hunt to look for different coloured leaves. Wheeled toys was great fun and the children had the chance to try out different types of bikes and scooters as well as push along toys. This is helping them to develop their gross motor skills and spatial awareness. Music and movement was lots of fun too. The children followed instructions to a music cd which involved marching, getting dressed and various actions. Please be aware we need parent helpers to make our woodies trips possible so if you are able to help please sign your name on the sheet provided on the noticeboard in nursery. Also be aware that helmets are required every second Thursday for wheeled toys. Many thanks.